Winchester Kinetic High Energy 40 S&W Ammo 155 Grain Jacketed Hollow Point ammo for sale online at cheap discount prices with free shipping available on bulk 40 S&W ammunition only at our online store TargetSportsUSA.com. Target Sports USA carries the entire line of Winchester ammunition for sale online with free shipping on bulk ammo including this Winchester Kinetic High Energy 40 S&W Ammo 155 Grain Jacketed Hollow Point. 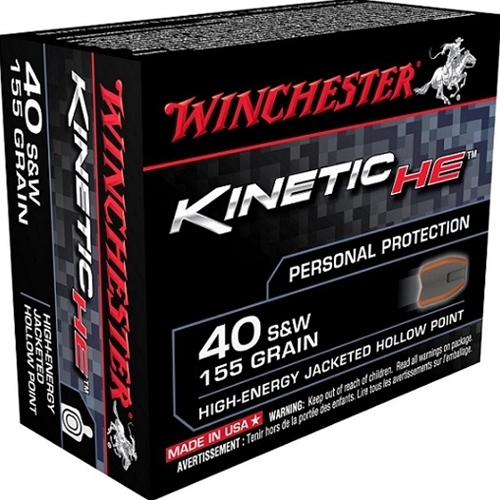 Winchester Kinetic High Energy 40 S&W Ammo 155 Grain Jacketed Hollow Point ammo review offers the following information; To millions of gun and ammo enthusiasts worldwide, the name “Winchester” means quality and high-performance by the most complete and versatile line of ammunition in the world. Winchester ammunition products have a long history of innovation behind them and have set the worlds standard in superior shooting performance. With the new line of Kinetic Energy, Winchester designed this 40 S&W ammo as well as many others calibers with the same advanced technology as many others calibers to produce high quality ammo for everybody. In the end, regardless of what the sport, game or circumstances surrounding you, you can always depend on every cartridge in the Winchester Ammunition line to perform - as promised. The new line of Kinetic High Energy handgun ammunition by Winchester was developed make best use of energy at the standard concealed-and-carry distances use. Thanks to this capability to maximize energy at such a close range, makes this line of ammo the optimum choice for personal protection and home defense purposes; this can be the solution to preventing situations from getting worse, especially at close contact. The Kinetic HE ammo is developed in nickel coated cases which have consistent feeding and the same proven reputation which is so common with Winchester powders and primers. Since the ammunition is designed as jacketed hollow points, the bullet can expand on impact for dependable energy distribution and optimal stopping power. The Kinetic HE ammo is developed in nickel coated cases which have consistent feeding and the same proven reputation which is so common with Winchester powders and primers. Muzzle Energy 503 ft. lbs.